I have divided up my fellowship into two stays in Cambridge: one in January and in one March. I have just returned from my first visit, which has been a wonderful experience in many respects. During my stay, I have mainly worked on an article about the origins of writing in Anatolia and the Aegean. These two regions are unfortunately often treated and studied as separate entities; the former is seen to belong to the ‘west’ and the latter to the ‘east’. This division is, however, a modern (and unfortunate) construct, which certainly did not exist in antiquity. Already from very early onwards there were intensive contacts between Greece and Anatolia and one could argue that the west of Anatolia and the Aegean can in fact be regarded as one cultural continuum. The seal of Tarkasnawa, king of Mira, bearing Anatolian Hieroglyphs around the central figure and equivalent Hittite cuneiform text around the outside, 13th C BC. An important aid to the decipherment of the hieroglyphic script. Image from HERE. In the second millennium BC, in both these regions pictorial writing systems emerge: Cretan Hieroglyphs (and later Linear A and B) in the Aegean and the Anatolian (or Luwian) Hieroglyphs in Anatolia. As has been pointed out, these scripts share some interesting similarities. In the last decades, our knowledge about the Anatolian Hieroglyphs has grown considerably. The script was one of the two writing systems in use in the Hittite Empire (ca. 1650-1180 BCE). Its decipherment was completed in 1973 and it turned out to be used for the Luwian language, an Indo-European language which was related to Hittite, the official language of the Empire. Inscriptions have been found at various locations in Anatolia, all the way up to the west coast. After the collapse of the Hittite Empire, the script continued to be used in the so-called Neo-Hittite city states in Cilicia and Northern Syria till around 700 BC. For a long time, it was thought that the Anatolian Hieroglyphs were an invention of the 15th century, but there are now sufficient grounds to believe that their origins date back to the beginning of the second millennium, which makes them contemporary with the Cretan Hieroglyphs. 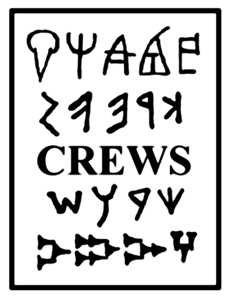 Unfortunately, the Cretan Hieroglyphs have unfortunately not been deciphered, which makes a direct comparison difficult. However, as mentioned above, there are some resemblances that deserve further attention. Both writing systems first appear on stamp seals, and the designs of these early stamp seals often exhibit a strong stylistic likeness. Further, both the Anatolian and Cretan scripts are pictorial writing systems, combining logographic with syllabic writing, consisting predominantly of Consonant-Vowel (CV) signs. The scripts are usually thought to be secondary inventions, inspired by the cuneiform script or the Egyptian Hieroglyphs. Interestingly, however, they show some characteristics that are not shared by the cuneiform script, nor the Egyptian hieroglyphs. I am therefore exploring the possibility that the Aegean and Anatolian scripts were in fact the results of independent regional developments. Left: Stamp seal with a handle bearing an Anatolian Hieroglyphic inscription, 14/13th C BC. Image from HERE. Right: Stamp seal bearing a Cretan Hieroglyphic inscription, 19th-17th C BC. Read more about the object HERE; image from HERE. At the weekend I went to London to visit the stunning Assurbanipal exhibition in the BM, which was more than worth the trip. In my remaining spare hours, I have done some final editing work on a forthcoming volume, which I am co-editing with my Leiden colleague Jorrit Kelder. The book (scheduled to appear in October of this year) consists of the proceedings of a workshop about the political organization of the Mycenaean world, which is still a hotly debated topic. I was also kindly invited to give a seminar at the Faculty of Classics about Anatolian Hieroglyphs on Wednesday January 23rd, with very enjoyable drinks and dinner afterwards. For the rest, I have very much enjoyed my discussions with the CREWS members Pippa, Robert, Philip, Natalia and Sarah, as well as other colleagues over coffee, dinner and in the pub. It was a very productive and inspiring stay and I am already looking forward to my next visit in March!